...Libby's conversations were indeed important, but they were less important at the time he had them than they became months later when the Justice Department launched its investigation. 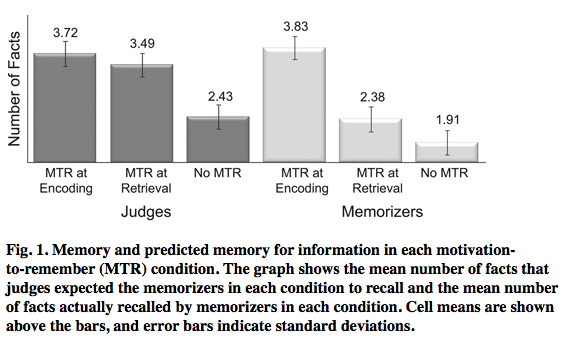 Although important information increases the motivation to remember (MTR), research on human memory suggests that MTR is considerably more effective when it arises before rather than after information is encoded...Do people take the timing of MTR into account when judging other people's memories? Memorizers were told that they would study the material for 2 min before seeing the photographs and trying to recall the facts associated with each. They were also told that they would receive $0.10 for each recalled fact. Before they studied the material, memorizers in the MTR-at-encoding condition (n= 21) were told that they would receive a $0.50 bonus for each fact they remembered about the individual named Beryl White. Memorizers in the MTR-at-retrieval condition (n= 22) were told about this bonus immediately after they studied the material. Memorizers in the no-MTR condition (n= 21) were not told about the bonus. After studying the material, memorizers were shown the photograph of Beryl White and were asked to recall the facts about her. Judges were shown the same material as memorizers and read a detailed description of the instructions from the MTR-at-encoding condition (n= 24), the MTR-at-retrieval condition (n= 21), or the no-MTR condition (n= 21). Judges were then asked to predict the percentage of memorizers in that condition who would remember each fact. Participants who were asked to judge another individual's memory did not distinguish between information that was important when the individual encountered it and information that became important only later. Clearly, people's theories about the effects of motivation on memory are imperfect. It is interesting to note, in light of these findings, that the U.S. District Court denied Libby's motion to allow expert psychologists to testify about the foibles of memory and metamemory because, the court argued, such research would tell jurors little that they did not already know.